In the desert outside Reno, Nevada, I experienced Transformation by Dust. The annual week-long Burning Man event brought about 65,000 people together from all over the world and all walks of life. There were families with children, babies, young people, and elders in every combination of attire or the absence of. There were classes and workshops, as well as music, art, and art cars all night and day. Black Rock City has the impermanence of a Tibetan sand painting. After the event, participants and volunteers ensure there's not a particle left on the five-mile stretch of desert that hosts the city. All structures, art installations, bikes, food, and waste disappear without a trace. In the midst of the lights, technology, and amazing creative expression, I was especially moved by the vastness of the deep playa (stretch of sandy substance resembling a beach), the space between things, and the absence of sound. In the darkness we rode our bikes through sand that was sometimes so deep I thought I couldn't go on, but I did. The sun could be shining and bright one minute, and then the dust would blow in and a whiteout veiled everything. We had to cover our noses and mouths not to breathe it in. Transformation by Dust: Ashes to ashes, dust to dust. Then it would clear, making visible the endless stream of bicyclists and pedestrians passing by in amazing attire -- maybe a tutu, a parasol, a flower headdress. The whiteout heightened our perception of the veils and illusions of separation that we create. My resistance to being pummeled by the wind covered with dust was perhaps that I would disappear completely. Another bout with mortality. As the phoenix, I rose from the ashes. When first asked by our friends to join them in a journey to Burning Man, I replied, "Not in this lifetime!" The experiences had always sounded so harsh. But my husband, Mark, said, "I've always wanted to go!" so we went. I had heard about a camp that offered Shabbat for over 500 people and I very much hoped to be part of that. Shabbat is Judaism's Sabbath and day of rest to celebrate and honor the creation of the universe. To my good fortune and great surprise, it turned out that the camp we were to be a part of, Milk & Honey, was the site and provider of the Shabbat celebration! Zaak Kerstatter of Zenotope is part of this camp. He is the son of our friend and traveling companion Sherry, and a musical and techno genius. 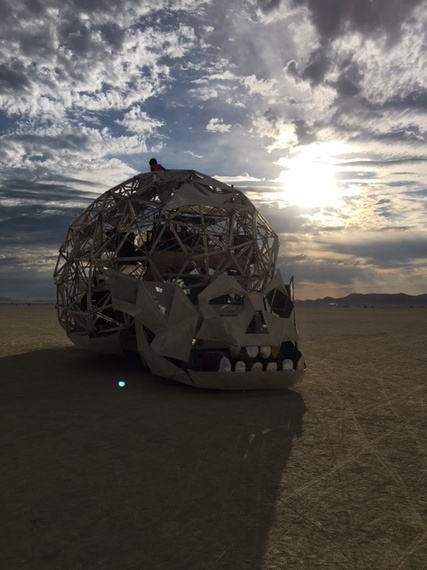 One of the highlights of our trip was the set he presented on the art car known as the brain. It was appropriate that he was inside a brain, because his set expanded mine and it resonated in my every cell. The lit-up brain started out in the dark at 5 a.m. pulsating with colored lights and people inside and sitting on top. A procession of us rode on bikes behind it. We went out to the deep playa and danced as we watched the sun rise. It was a spiritual experience! Then Mark and I rode to the Temple. People write on the walls and create shrines with photos, tears, and memories, leaving them behind. The Temple is burned on the last night of the event. The grief inside was palpable. People were sitting on the sand floor and often a cry could be heard and tears were shed. Someone might offer a comforting hand or do energy clearing. It was cathartic to write the names of our dearly departed, or a goodbye letter on the wall with all the others. It was a portal to another dimension. And before we knew it Friday arrived, Shabbat Shalom. The camp was organized to accommodate the 700 pilgrims that would arrive hungry for food and drink as well as the deep nourishment of spiritual connection. As sunset approached, the tribes gathered and were welcomed and seated. The ceremony began with a song that opened our hearts to receive this sacred communion. The candles were lit as we acknowledged the Source of strength that blesses our lives and those in need of healing, and renews our body and spirit. More songs were sung and prayers shared the sacredness of our tribe and traditions. Yes, we are one tribe, with all our individuality and expression. The tables were set and the challah, food, and wine were served. We feasted. There in the desert, it was manna from heaven. The following night the man was burned (photo) and fireworks filled the sky. With him, all things I was ready to let go went up in the pyre. Transformation by Fire. That's what Burning Man is all about: release and transformation, individual and collective. Welcoming our diversity in our oneness. Living and supporting each other because we all are needed. Giving freely and accepting gifts in all their guises. In Black Rock City, each drop of water is more precious than gold. Dwelling there heightened our awareness of loving our Earth and resources, walking and living lightly, leaving no trace. Burning Man celebrates creation and the spirit that unites us.